Stupid IKEA Question - Using kitchen cabinets for bathroom vanity? This is probably a stupid question, but I was wondering if someone has ever used IKEA's kitchen cabinets in their bathroom? I was considering using a 30 kitchen sink cabinet from the ABSTRAKT line in the bathroom as a vanity cabinet, and slap on a granite countertop and drop on a vessel sink on top of the granite top....will that work?? is there anything special about kitchen base cabinets that would not allow them to work for bathroom vanity cabinets? Re: Stupid IKEA Question - Using kitchen cabinets for bathroom vanity? I am going to, I think. I read about someone doing it and I thought it sounded like a (DUH!) great idea. The case I read about was using the over the fridge cabinets (which would be shorter) and hanging them on the wall so they're up off the floor. 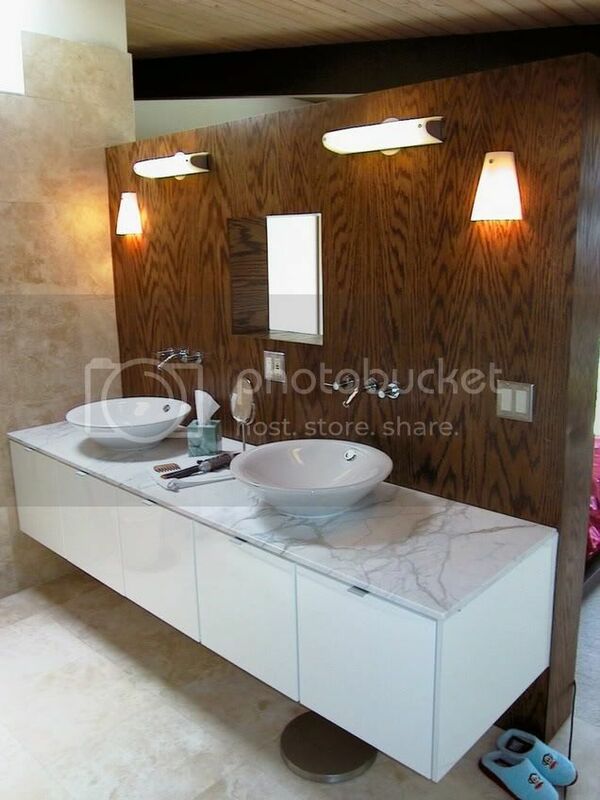 Same look as a lot of those expensive mod floating vanities, way less $$. A typical bathroom vanity is shallower than a kitchen cabinet, but you could easily mod the ABSTRAKT to be shallower by ripping it down if that matters. At the Mpls store I also saw small square lockers that were wall hung with the butcherblock countertop over them in a bathroom for a shelf/storage combo, and I think this could work for a vanity as well, using those bigger locker storage cabinets they sell, minus the legs. I can't see any reason you couldn't. You might want to get better legs if you want exposed legs, or just get their semi-cheesy toe kick system. I have one of their vanity cabs in one of my rentals and it's made essentially the same as the kitchen cabs although I think the kitchen hardware and doors are a little higher quality based on my recent kitchen installation. Keep in mind that the cabinet boxes tend to be the weakest link in their cabinet designs because of thin veneer and brittle particle board, so too much water or banging up might show after a few years. Another awesome value is their Hollviken bathroom sink! It's $70 and really cool, and very solid. I installed some IKEA Hallarums in my master bath. The cabinets are deep, and took up a lot more space than my architect designed for, therefore, I have less room to move around. Oddly, this was something I overlooked - scaling the vanity size from the drawing before buying cabinets. If I were to re-install, Id definately consider ripping the backs so they are not so deep. I think Id trim the legs as well, since my cabinets are a little to tall. I didnt notice that until the first time I tried to bend over them to spit my toothpaste out. Other than the size issues, Ive been quite happy with my Ikea cabinets in the bathroom. I'm the one who is using the above fridge cabs (36Wx24Dx15H) to mimic the Kohler Purist suite look. Hubby got the idea as we walked through the kitchen area for the umpteenth time. We are still pretty far away from actually installing them, so I can't tell you how it worked. However, I have heard of other [url href=http://www.ikeafans.com/]fanatic Ikeans[/url] using the cabs for all areas of their home, so I can't imagine why it wouldn't work for you. Realpill's comments about the water and banging are top of my mind, too, since my husband has this crazy idea of using one of the side panels to face the side of the soaking tub (not sure what the box w/the tub inset is called). I have a feeling that I'm going to want to put some sort of finish on it so that the water that splashes out of the tub and drips down the side doesn't cause the veneer to buckle over time. I had the same idea. Except, I was thinking of wall mounting the docent ikea tv cabinet. To mimic the kohler purist suite on a budget. Does anybody think this would work? the center divide and your plumbing are going to be be in the same spot (if you have the sink on center). also, how are you going to use the sliding drawers with the plumbing inside? According to the ikea fans website. There is 3 1/2 to 4 of space behind the drawers. I was hoping I could fit all the pluming behind there. I wasn't planning to the have the sink on center. Does this make sense or am I crazy? Now that they have killed off the Laxan line, I have been having the same thoughts. The two problems with using a base cabinet are the height (at 36, they are about 3-6 taller than typical bathroom vanities) and depth (at 24, they are 2-6 deeper than most vanities). The sink cabinets do not have drawers, so that would not be a problem. But for another option, there is also a 12/15/18/21 base cabinet that only has a single door. But I am loving the 30 x 15 1/4 x 24 deep refridgerator cabinet idea. With a little extra bracing, I think it would survive as well as any other Ikea piece. Using the kitchen cabinet for the bathroom is no problem. We used one for a little guest bathroom. Everyone in our household is 6' tall and above, so the added height on the cabinet was welcome. I do recommend ordering the matching side panel piece rather than leaving the cabinet siding (with holes) exposed. Or you may be able to find a piece in the As is section that fits your needs. Go for it! we actually have one of these sinks, on a white bathroom cabinet with aluminum framed glass doors (all IKEA), and it works great for us. 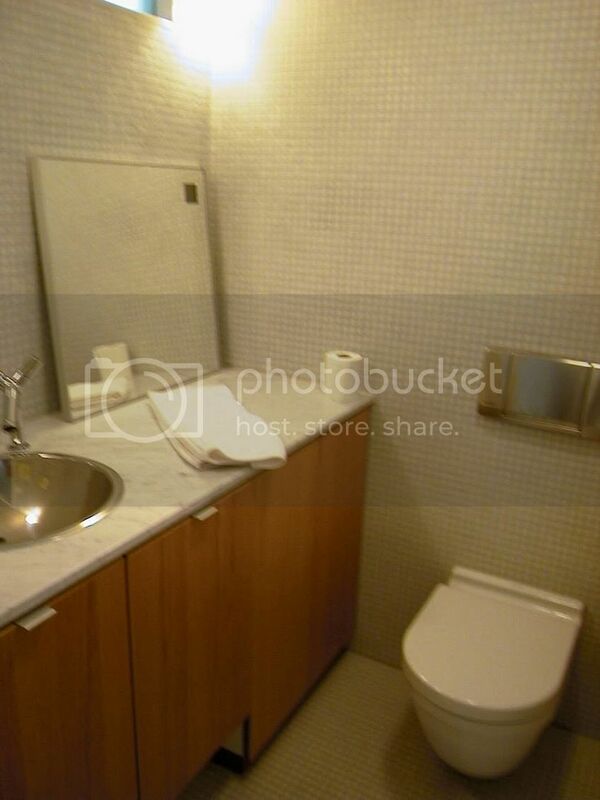 it is a really clean look, and i'm often surprised how non-cheap it appears in that little bathroom. the closet across from the sink also has a door that matches the cabinet doors, so that helps. other than the over-fridge cabinets, what is the draw to use kitchen cab's instead of bathroom vanity cabinets, which work perfectly with a sink like this (they're designed to go together). we just bought the exact same sink and vanity for our bath remodel. Pretty much the only 'modernish' option we could find that wasn't over $800 or so. I imagine the kitchen cabinets would work just fine as well. I actually prefer a taller vanity (as I'm taller) anyways. Boy, I'd be really careful using ANYHTING made of particle board in a bathroom. The vanities or kitchen cabinets are a possible exception because with a careful eye and quick action, plumbing and maintenance problems can be solved or cleaned up quickly. I know Ikea is a tempting solution for the budget, but nothing beats quality of construction in the long run and those veneers and particle board do not hold up to lots of use. BrianB, I don't know if you've seen the Docent line in person, but it's a fake wood veneer. I like the look of it too, but was unimpressed by the quality in person. I don't mean to be a wet blanket, but I've found through experience that the cheaper Ikea furniture doesn't hold up over time. If you go into it knowing this, they can be a great solution to get you through a few years until you can afford something more solid. At least it'll look pretty good. thanks realpill I haven't seen the docent line in person. I was just going by the pics online. I am going to keep looking. The fridge cabinet might be the best option. I saw an add for http://www.cabparts.com/main.html in Fine Homebuilding and was intrigued. it seems like they might be a high quality, and possibly resonably priced, option for even small jobs. has anybody used them? I thought maybe I was the only crazy one considering using Kea kitchen cabinets for my bathroom. I have a very tiny bathroom, so storage in my vanity is very important. I absolutely love the Porcher Onda suite with the big pull out drawer under the basin. My husband came up with the idea of using the Ikea Cook Top Base for our vanity. It has a panel across the top and 2 big pull out drawers at the bottom. If we put the cabinet on legs and use a vessel sink, then the panel at the top should help acoomodate the plubming. We'd probably have to reduce the depth of the cabinet as much as possible to make it work. Is this an insane idea? no, it's fine. we use kitchen cabinets in bathrooms all the time. We actually did this in our bathroom, not using an Ikea cabinet but a kitchen corner base cabinet from Home Depot. We wanted our sink on a diagonal across a corner so this worked perfect... we did the granite counter and vessel sink thing too (even installed it all ourselves). Just make sure to brace the cabinet solidly to the back wall surface with 2x4's and L brackets so the whole thing is solid as a rock before putting on your countertop and sink. Also, we dropped the cabinet right on the floor instead of using legs because of the extra height of the vessel sink on top of the counter...(my girlfriend is just 5' tall) so keep that in mind for any short people in your household. Good luck! I dont understand why so much melamine or MDF is used. Is it because it is greener, or is it simply because it is cheaper? It seems to make most furniture feel cheap, and flimsy. Not to mention cabinetry. Paper thin veneers that fall off when they get wet, edges that arent sealed against moisture which causes the piece to expand, or worse fall apart. Can someone explain to me why that is the first choice in cabinets? A quick google of RTA (ready to assemble) cabinets turns up a load of places that offer the melamine cabinets, but relatively few that offer cabinet grade plywood. Here is a few that offer RTA with melamine or nice veneered plywood. And that's just a few. You can do the same search and poke around, you may find some even nicer ones yet. Now, not all of them are Ikea style modern, but most of them have a more modern style available, and then you can buy your pulls/handles what have you wherever you like. Just thought I would offer some alternatives. We started looking at RTA cabinets delivered, and found that for about the same money as home depot/lowes particle board cabinets (low quality) we could get some nicer RTA cabinets. We are willing to glue and screw cabinets, no problem. They ship flat, so the shipping isnt TOO steep. Some of them don't have as many cabinet shapes and styles as we would like, but neither did the big box stores. In the end, we have chosen RTA units. You may even find someplace that manufactures them that is within some decent driving distance, you could rent a truck and pick them up yourself. May be able to save a bit more that way too, if price is what you are shopping. What you find in most commercial cabinetry is particle board, because it's inexpensive and does the job. MDF is uncommon except in specialized applications (like speaker enclosures, where it does a good job of acoustic damping), because it costs almost as much as plywood, and both cost more than particleboard. So basically, it does come down to cost. Are particle board and/or MDF greener? They can be, but there's such a wide range of greenness for all three materials that you can't make a blanket statement. The one place where plywood outdoes the others is in shelving. The adhesive binder in both particle board and MDF creeps over time, which means that a shelf under heavy load will gradually deflect more and more. This is much less of a problem with plywood. Otherwise, either MDF or a high-quality plywood (like Baltic Birch) is my material of choice when I'm building boxes. If everything is going to be veneered (or melamined) and edge-banded, I'll choose MDF, because it's consistency is so uniform (although it's also heavier). If I want to expose the plywood edge, I'll use Baltic Birch (or, these days, Europly, which is available FSC-certified). I just posted to a similar topic on the furniture, fixtures board next door, but I saw this and thought I'd chime in. Yes, you can use IKEA kitchen cabinets for the bathroom. Actually, we wanted to float our cabinets and couldn't find any that matched the specifications we were looking for, so we just ended up building some out of MDF and facing them with IKEA cabinet doors and hardware. We couldn't use the IKEA cabinets themselves in this size because they were not deep enough. We needed 24 deep cabinets to accommodate the vessel sinks we have. Here's a pic to see what we're talking about. We also used the same idea in our guest bath, by the way. These are IKEA kitchen cabinet doors, too (sorry about the poor picture quality). This is a new idea to use kitchen cabinet in bathroom,I am just remaking my room and will surely give this idea to my remodeler.